Since the Smart Nation initiative was launched in late 2014, progress has been made in applying digital and smart solutions to provide better services for our citizens and businesses. Companies have also responded with innovative products. 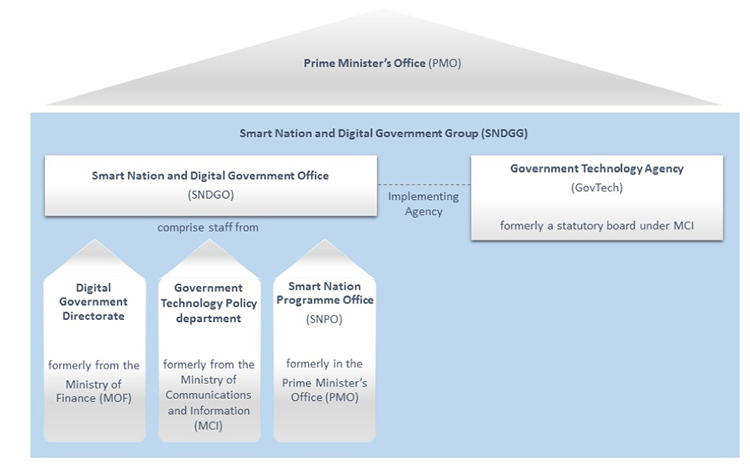 The Smart Nation and Digital Government Office (SNDGO) will be formed under the Prime Minister’s Office (PMO) comprising staff from the Digital Government Directorate of the Ministry of Finance (MOF), the Government Technology Policy department in the Ministry of Communications and Information (MCI), and the Smart Nation Programme Office (SNPO) in the PMO. The Government Technology Agency (GovTech), a statutory board under MCI, will be placed under the PMO as the implementing agency of SNDGO. Collectively, the SNDGO and GovTech will form the Smart Nation and Digital Government Group (SNDGG) in the Prime Minister’s Office. Figure 1 [below] illustrates these organisational changes. Develop the digital enablers and platforms for Smart Nation, to grow economic value and catalyse innovation by companies and citizens. The SNDGG will build on the ongoing work by GovTech to enhance data sharing through data.gov.sg, and partner the Monetary Authority of Singapore (MAS) to promote e-payments. The SNDGG will also drive the development of a national digital identity framework to facilitate digital transactions, and a national sensor communication backbone (the Smart Nation Platform) to support agencies’ use of Internet of Things (IoT) applications to fulfil their missions. Drive digital transformation for the public service, to strengthen Government ICT infrastructure and improve public service delivery. The SNDGG will build up digital capabilities within Government, including in areas such as data science and IoT, to continue delivering excellent public services to our citizens. The SNDGG will be overseen by a Ministerial Committee chaired by Deputy Prime Minister (DPM) Teo Chee Hean. Dr Yaacob Ibrahim, Minister for Communications and Information will be Deputy Chairman and Minister-in-charge of Cybersecurity and the Info-communications Media Development Authority of Singapore (IMDA). The other members of the Ministerial Committee are Dr Vivian Balakrishnan, Minister-in-charge of the Smart Nation Initiative; Minister Ong Ye Kung, who has been appointed to champion Public Service innovation; and Minister of State Dr Janil Puthucheary, who will be the Minister-in-charge of GovTech and who will also coordinate GovTech’s strategy with IMDA’s industry development efforts. Mr Ng Chee Khern, currently Permanent Secretary (PS) (Defence Development) of the Ministry of Defence (MINDEF), will concurrently lead the SNDG Group as the PS (Smart Nation and Digital Government). Mr Ng will also retain his appointment as the Chairman of the GovTech Board. The Government Technology Agency of Singapore (GovTech) is a statutory board formed in October 2016 after the restructuring of the Infocomm Development Authority. GovTech works with public agencies to develop and deliver secure digital services and applied technology to individuals and businesses in Singapore. GovTech builds key platforms and solutions needed to support Singapore as a Smart Nation. As a leading centre for information communications technology and related engineering such as the Internet of Things, GovTech also enhances the capabilities of the Singapore Government in these domains.